I'm not in a place to research them right now and they are tax free today. Wife wants to get one that can run basic home necessities via transfer switch. Preferably something that can be bought commercially. I'd get the biggest Generac your budget will allow. We have the 17.5 kw unit at work, and it gets used quite a bit out on jobs, never broken down. Got a hell of a deal on it, too. It was a refurb. unit, and IIRC, we paid around 1500 for it I think, but that was like 4 years ago. Need more info, like what specifically you plan on running and what fuel type you're looking for. I got the Westinghouse 9000 from amazon and a Generlink throwover. So easy the wife can wheel it out and plug it in. Plus if i move it all goes with me. The Westinghouse went all night on one fill up. Hondas are very good. They are also pretty quiet. what size breaker for your septic? No clue. It hasn't been installed yet. It'll run a fridge and lights no problem. Would need stats on the pump. Municipal water or a well? Check the Generac propane generators on sale at Home Depot today. Swinging by there when I leave here. Well crap. I hope they offer free shipping. Here is the small one they make a size bigger. Champion makes dual propane gasoline generators. I would check them out. I think the ideal size is about 3- 3.5 kilowatts for fuel efficiency and most of them are pull start instead of electric start. If I am not mistaken a aerobic system septic tank is pretty low demand for wattage. What's the fuel consumption rate? I stayed away from LPG/propane because I don't have gas service and the price of burying a 1,000 gallon tank was more than I wanted to spend. I have read reviews that say they do better in practical application. I am prepper holidaying it too. I have no personal experience yet. But I want a propane generator. You put up to a 30lb cylinder on the generator for mounting. Might be heavy but a propane generator will have less long term engine maintenance, and propane doesn't go bad. From a prepper perspective you will only have power with a gas generator if you have gasoline. If your gasoline is bad and there is a crisis, will you be able to get more? I know you will eventually run out of propane but at least you can stock up if you want and save it long term. We are having a 1500 gallon tank buried. So propane may be a good option. As cool as that is, we are having a 10.5 kW solar system installed Wednesday. I am told with a good electrician a nifty override switch can be installed should a long term power failure situation happen. I am looking for something short term and more universal, since generators are tax free today up to 3,000, that's why we are impulse buying one. Just in case. I got a 4800watt Robin with electric start for $500 from a buddy who works at a dealer and had overstock. you'd better learn quick or you are going to overspend for under-performance and with the wrong fuel. i really don't know why folks "panic buy" without doing their homework. Man a 17.5kw unit for 1500 sounds like an incredible bargain. A former client has a 100kw nat gas fired unit they would give away for a couple thousand...mostly because it can't be permitted in CA anymore. most residential solar setups can not be used as a backup power source. a "good electrician" with a "nifty override switch" will not change the fact that the common inverters require a source of AC power to synchronize with, and using a generator for such purpose will not work. you need 15 gallons of gas PER DAY to run that at half load. That's fairly typical of a big generator like this. People are panic buying because they are tax free today, and the wife tasked me with getting one this morning. Some generators put out voltage that isn't stabilized for sensitive electronics. They mess with computers and radios and such. 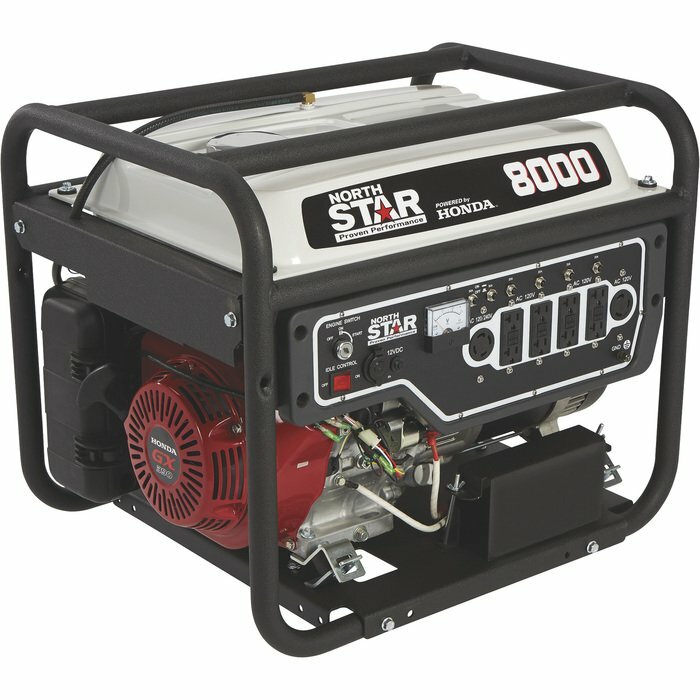 If you think you may ever need to use a ham radio or computer off of generator power you might want a genset with a good voltage regulation section. . Wait, what? Why are generators tax free today? I bought it roughly 8 or 9 years ago and had no problems with it . I had a transfer installed where I can pick the breakers I want on in my home when running the generator . It pretty much runs my whole house and have used it for a week straight after a hurricane took out all the power in my state. Just in Texas. State comptroller did it for all emergency prep supplies up to $3k due to all the natural disasters such as tornados and floods. Why won't a 240V output generator work as a sync source? Voltage too dirty? 3500ish Watt or less AC generator, usually 120v, quite a bit louder ~250-400 range (best bang for your buck… louder though, good fuel economy, easily run fridge and load you specified, but have to be careful trying to power a whole house if you have high draw electric appliances). I have a champion 3500w remote electric start, manual transfer switch and it easily runs the whole house with all the lights, TV, fridge etc, but all my water heater, range, and appliances are gas so it's easier. 7kW 240v, basically same as above, but wired to pull both poles at 120v ~350-800 range, cheapest, will run the whole house without a problem generator so long as you're reasonable. Will run your electric range and most standard electric water heaters. Costco has the Champion tri fuel ones on sale a lot for $600. The Northstar posted would also be a good generator in this category but on the highest end of the spectrum of options. Dedicated standby generators, see generac, etc $2000+ typically plus install, typically NAT gas or propane. The best. Yamaha is 2nd. I'd get a Honda with lower wattage over a lesser brand . With some transfer switches you can swap between various circuits. Run the fridge for a while, then switch to water heater, etc. The little ones are practically silent. I was a KCR once, walking through the campground. I heard what sounded like a breeze through trees...and almost tripped over a honda generator. that's what I did, just note a northstar 8000 is really a 6,600. they are powered by Honda and built with good components. Why not get a generator that runs on gas and retrofit it to run on propane? they you will have a generator that can run on two different fuel sources. Got it, had a nice little coupon attached and tax free. Just got it wheeled in. They want $199 for the wheel kit for this thing? WTF? Two hundred bones for a couple of wheels that bolt on. Yeah the wheel kit when up in price.